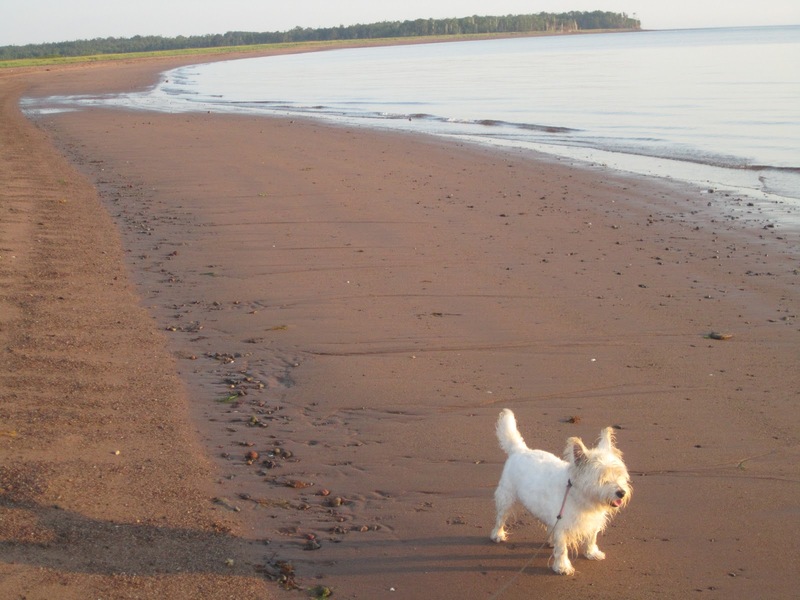 It is about a 45 minute drive from our home to the ferry terminal at Wood Island, PEI. We arrived to a fairly full parking lot but it looked like we would "make" the next loading. 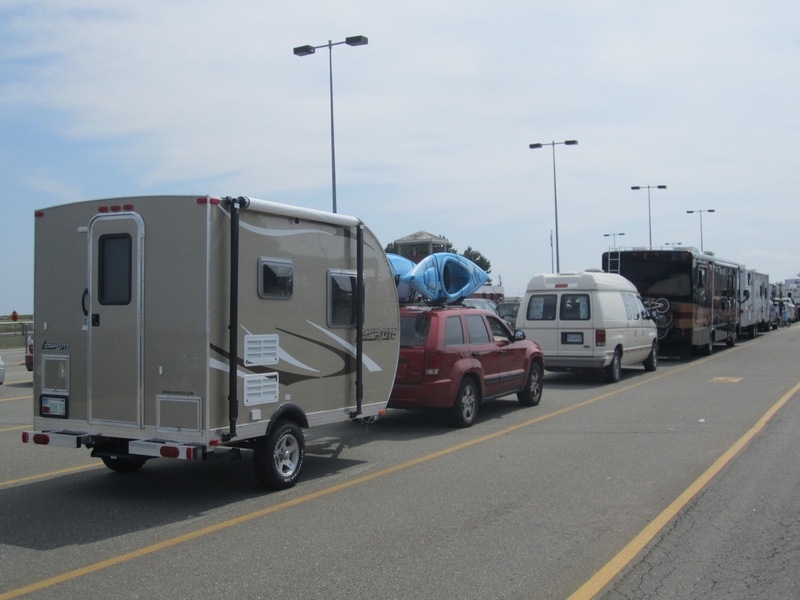 We paid the $95 toll and took our place in the rv lineup. 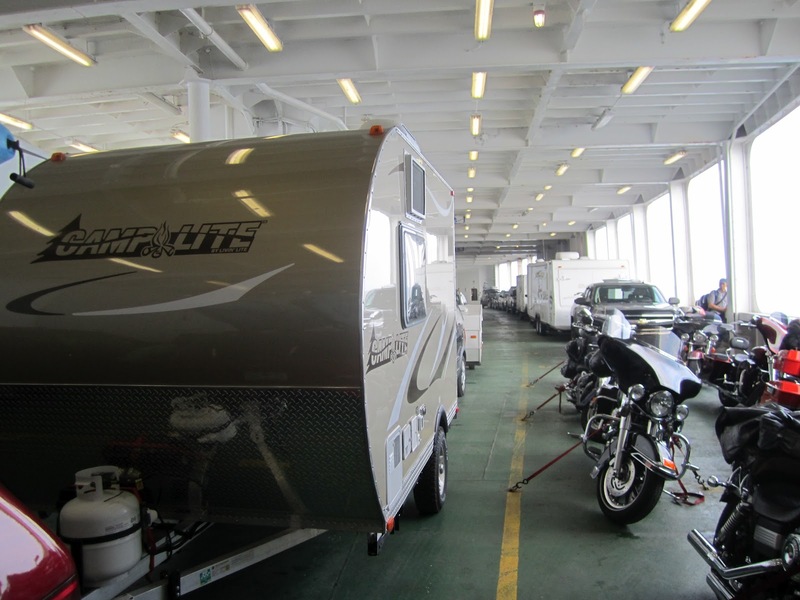 (They have separate lineups for different kinds of vehicles because they have to load them into different decks). After taking the ferry many times you come to be able to judge the lineups and assess your chances - or at least you think you can! Our chances looked good but it wasn't to be. The ferry loaded including all the rv's in the line in front of us and about a dozen cars that arrived after us. We were left behind -- left at the front of the line for the next boat. That meant we would have to wait about 105 minutes in the sweltering sea of asphalt for the next scheduled crossing. We shrugged off our misfortune. I got out and talked to the young 20-something that pulled up behind us with a huge fifth-wheel. I also talked with some nice people from Florida who were up exploring the Maritimes and a guy who thought our trailer was the perfect size. The time flew. 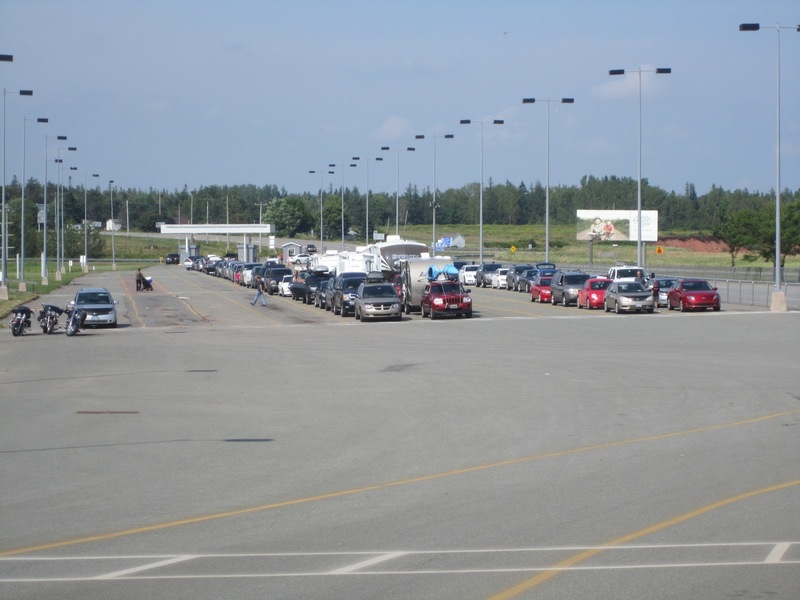 During the wait, the terminal's parking lot started to fill up again. In the days before the big bridge was built the ferry lineups would often reach a mile or two up the road outside the terminal. My parents once waited more than 10 hours to get on a boat. Compared with that, having to wait one boat wasn't too bad. Once we were on the ferry we had to leave our vehicle deck and proceed with all the other passengers (and many pets) up onto the passenger decks. Out on deck we found a shady picnic table to wait out the 75 minute crossing. That time was spent people & pet watching. There's always a great mix of people on the ferries: families with kids, honeymooners, seniors, truckers, bikers, farmers, and cyclists. Besides local English & French accents on the ferry you may in the summer tourist season hear German, Cantonese, Dutch, European & Quebec French, Japanese and all varieties of American accents. 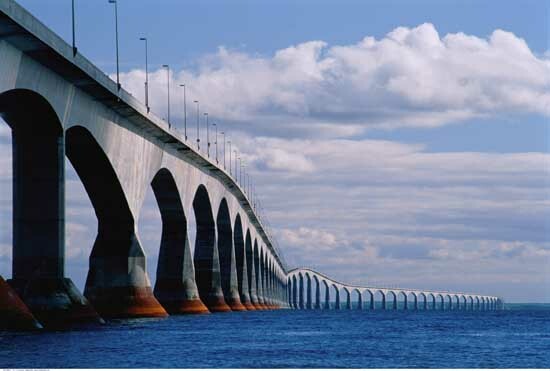 It really highlights that tourism is an important industry here in the Maritimes! The crossing itself was quite uneventful. My wife did see a seal bobbing up & down a few hundred yards away from the boat. 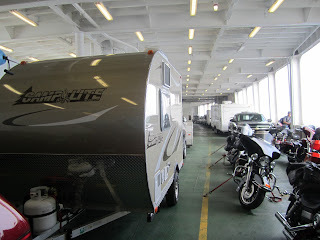 The only other unusual thing was seeing the biker group openly drinking beer & wine on deck. Drinking isn't allowed as the ferry is basically an extension of the highway system. After their drinks they got back on their bikes and drove. Thankfully they only had one drink each and likely were under the legal limit. Once we arrived in Nova Scotia the unloading went smooth. After waiting for the walk-on passengers to disembark, and a few cyclists in a group of teens from Vermont, we were the first vehicle to drive off. We were followed by the bikers. 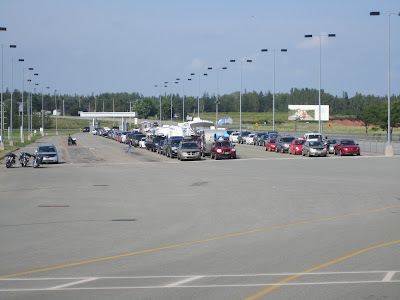 Our campground reservation was at Caribou/Munroes Island Provincial Park that is only a few miles from the ferry terminal. We spent two nights there in a nice clean un-serviced, wooded, camping site. In the next site were friends from Nova Scotia who we shared the weekend with. It was a great first camping trip in our little Camplite trailer. I include a picture of the campground's beach. When Dixie the dog & I went for an early morning walk we had the unspoiled beach to ourselves. Perfect! Dixie likes Nova Scotia's beaches!